You’ve probably seen this already. (I hope you have, because I’d personally make it front-page news all over the country.) The New York Times ran a story yesterday that exposes a secret Justice Department brief endorsing torture, written after the same department publicly denounced the same tactics. When the Justice Department publicly declared torture “abhorrent” in a legal opinion in December 2004, the Bush administration appeared to have abandoned its assertion of nearly unlimited presidential authority to order brutal interrogations. But soon after Alberto R. Gonzales�s arrival as attorney general in February 2005, the Justice Department issued another opinion, this one in secret. … The new opinion, the officials said, for the first time provided explicit authorization to barrage terror suspects with a combination of painful physical and psychological tactics, including head-slapping, simulated drowning and frigid temperatures. This is sickening on so many levels I don’t know where to start. Congress is already demanding to see the secret opinions so they can hold hearings, so hopefully this can be brought into the light swiftly and dealt with harshly. I really don’t want to discover that we’ve become the kind of country that does otherwise. Argh. It’s official: The Bush administration has given up on even pretending they’re subject to the rule of law. A bra and a pair of knickers have been blamed for a flood and road collapse in County Durham. 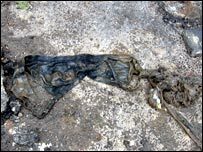 Northumbrian Water said the underwear was flushed down a toilet and caused a blockage in a sewage pipe in Middleton-St-George, near Darlington. Heavy rain, together with a build up of grease and fat, caused the pipe to burst and the road above to collapse. The road will remain closed for days and Northumbrian Water estimates repairs will cost more than �15,000. The company has now urged residents to think carefully about what they flush away. A spokeswoman said: “If the underwear had not been flushed down the toilet, this would not have happened. It was very irresponsible behaviour. When we dug down to inspect the damage, we found a bra and knickers had snagged itself across the nine-inch diameter of the pipe. There was also a heavy build-up of grease and fat, which contributed to the situation. We were forced to repair a 2m section of sewer and a 10m section of road was affected. These pipes are not designed to carry bras and knickers.” The spokeswoman said it was impossible to trace the owners of the underwear.